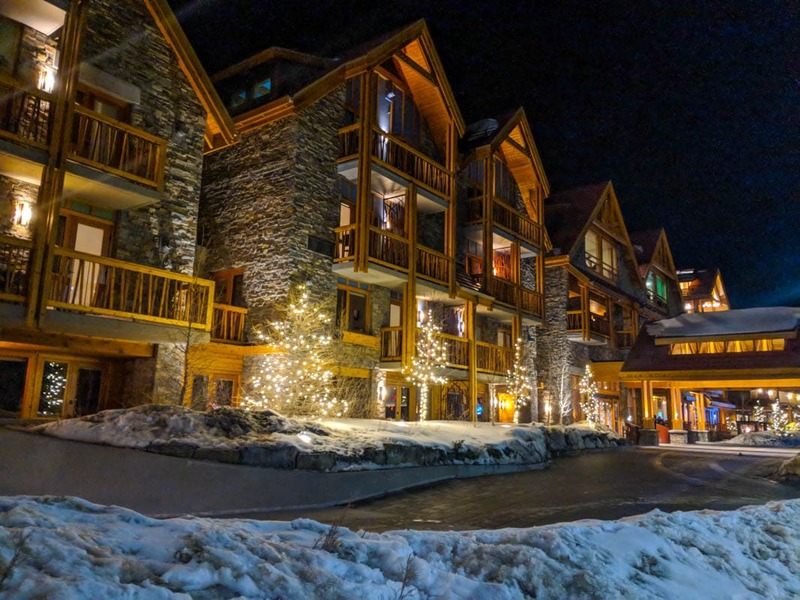 From Calgary to Canmore, Banff to Lake Louise, find out the best restaurants, bars and hotels to visit in winter in Alberta, Canada. So you’re planning a trip to Alberta in Canada in the winter? With some of the most stunning snowy scenery on the planet, and plenty of activities to keep you busy (from ice climbing to snow tubing) there’s no doubt you’ll spend a lot of time outside. 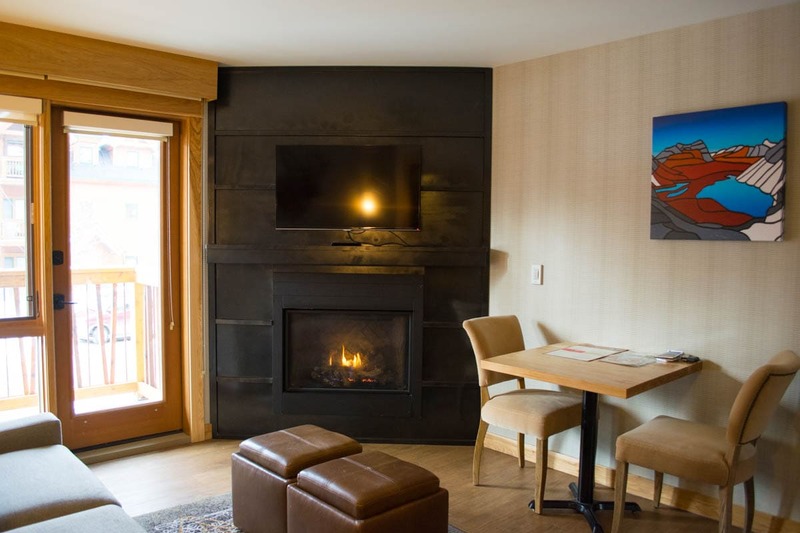 We looked forward to cosy dinners in cute mountain lodges, thawing by a toasty log fire. We spent a week in the region, driving from Calgary to Canmore, then on to Banff and Lake Louise, with a little trip up the Icefields Parkway. During that time we enjoyed a few different types of accommodation, from modern town hotels to secret mountain lodges. We also sampled some of the very best cuisine in the region. 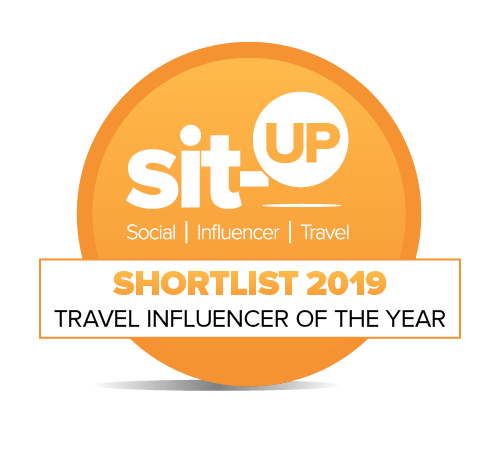 It’s time to reveal a few of my highlights, and believe me – some of these places are so cosy, you won’t want to leave! 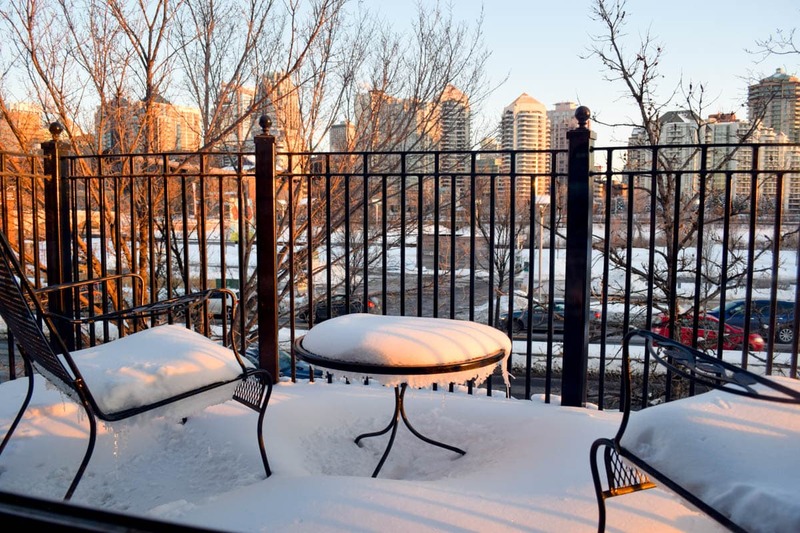 The Kensington Riverside Inn is a smart boutique hotel in a great location just north of Downtown Calgary. It’s not far from the big city skyscrapers, in fact you can see them from the window, but it’s in a calmer location near the Bow River. It’s the city’s first Relais & Chateaux hotel – the hotel association which only recommends the best accommodation around the world. I loved our suite, which had a chic aesthetic with brown and gold décor. My favourite feature was the gas fire in the corner. Our room also had a balcony, which although it was covered in snow during our trip, no doubt would be a lovely place to relax once the seasons warm up! Breakfast was served in the restaurant downstairs, and there was also a bar and underground parking. An added bonus was the hotel’s proximity to a street filled with bars, restaurants and cafes! Not far to walk to a good hearty meal and a warming glass of wine when the temperatures were icy. 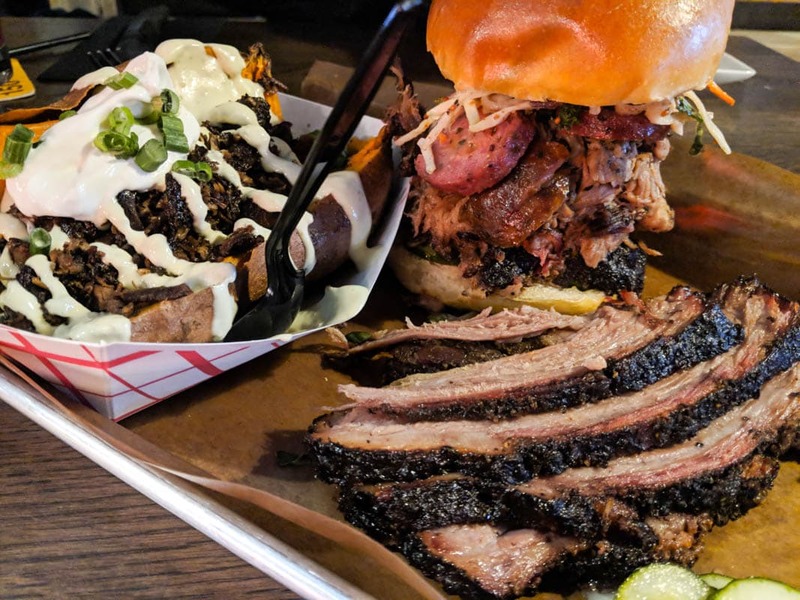 There are plenty of things to do in Calgary but I’d say visiting this Texas BBQ joint should be high on your list! 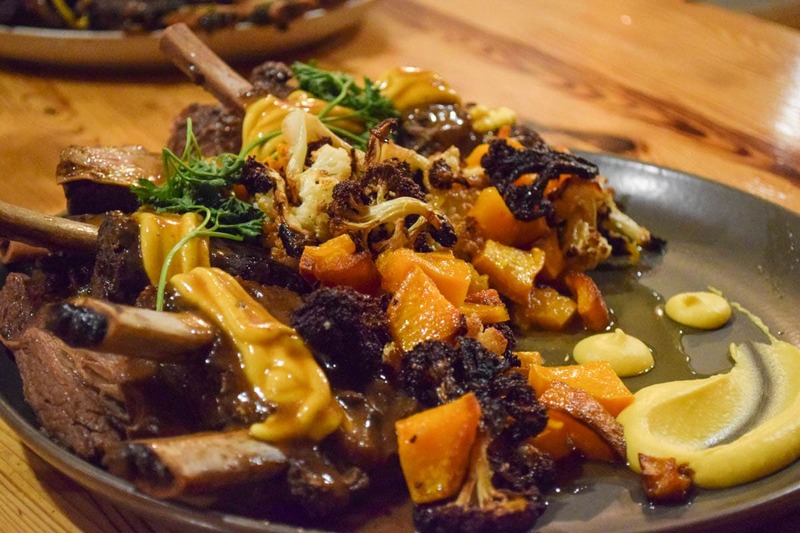 It’s a carnivore’s paradise, and a great place for a hearty meal in Calgary. From tasty brisket and pulled pork to sticky ribs, Hayden Block’s menu is packed full of flavour. I loved the variety of sides, which include deep fried pickles, hush puppies, macaroni cheese and corn on the cob wrapped in bacon. My top pick was the ‘hot mess’ – a sweet potato slathered in all sorts of delights! To wash it all down, they have a varied list of whiskey cocktails (the smokey theme continues!) 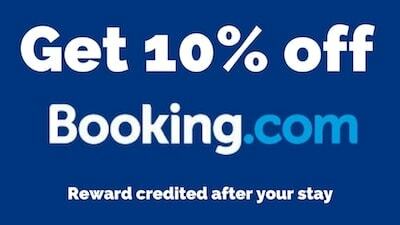 plus daily drinks deals to entice you even more. We were lucky enough to stay at a few of Alberta’s characterful lodges during our trip, and we loved them! They’re full of charm and often in the most picturesque of settings. 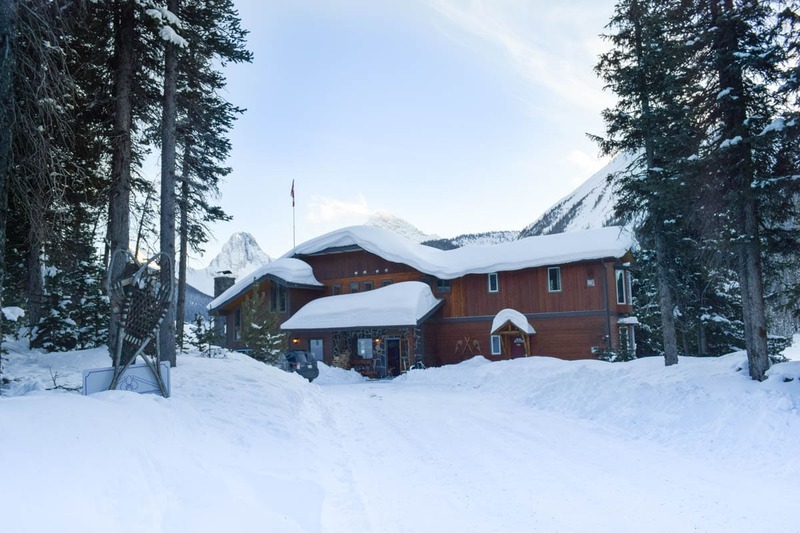 This one is almost an hour’s drive from the nearest big town (Canmore) so consider this a place to escape from the world. We stayed in the main lodge, but there are also cabins and a cute yurt at the end of a trail which sleeps four people. The views in winter are breath-taking – looking out onto a snow-covered valley with the Rockies just beyond. There are plenty of ways to explore the untouched wilderness, whether that’s cross-country skiing, or using Mount Engadine Lodge’s snowshoes or fat bikes. Once you return, there’s a sauna downstairs to warm up! 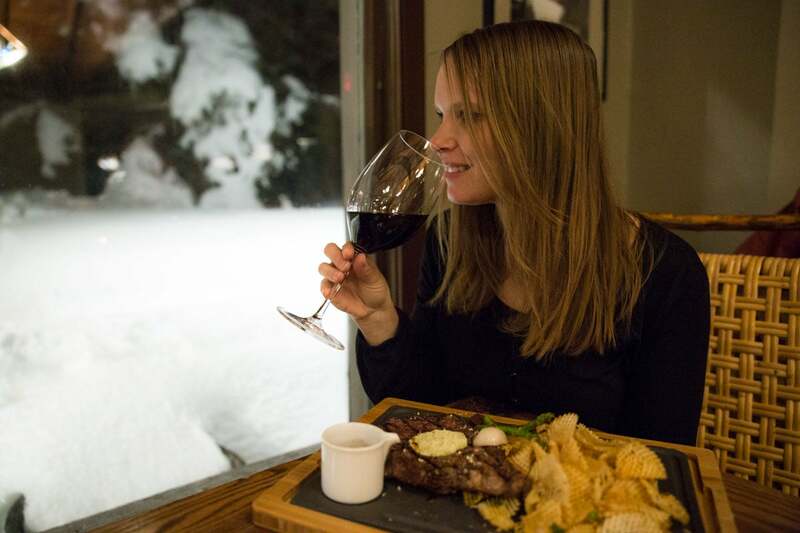 I loved Mount Engadine’s approach to food, with its all-inclusive, family-style set up. Breakfast is included, and they also make you a packed lunch for your adventures outside. In the evening, everyone staying at the lodge dines around one large table, enjoying a feast of fresh ingredients and sharing stories from their day. 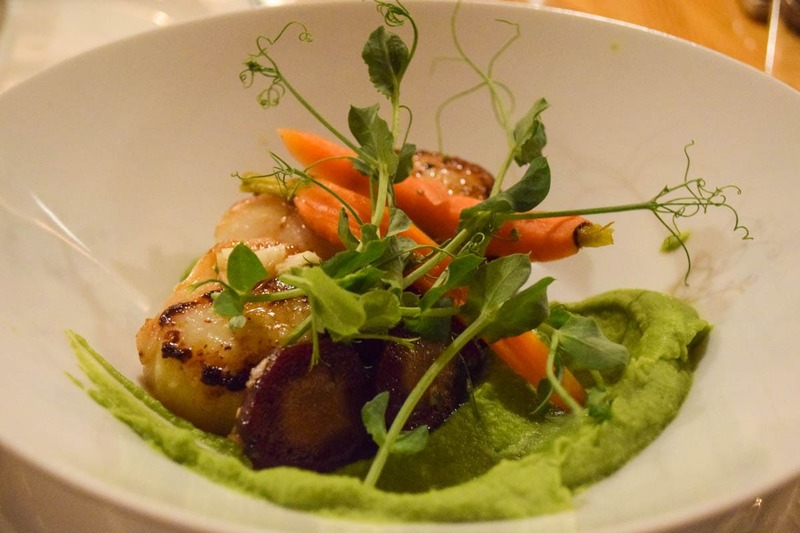 On our first evening we enjoyed perfectly cooked scallops with a flavoursome pea puree and heritage carrots, followed by tender beef short rib with roasted root vegetables. 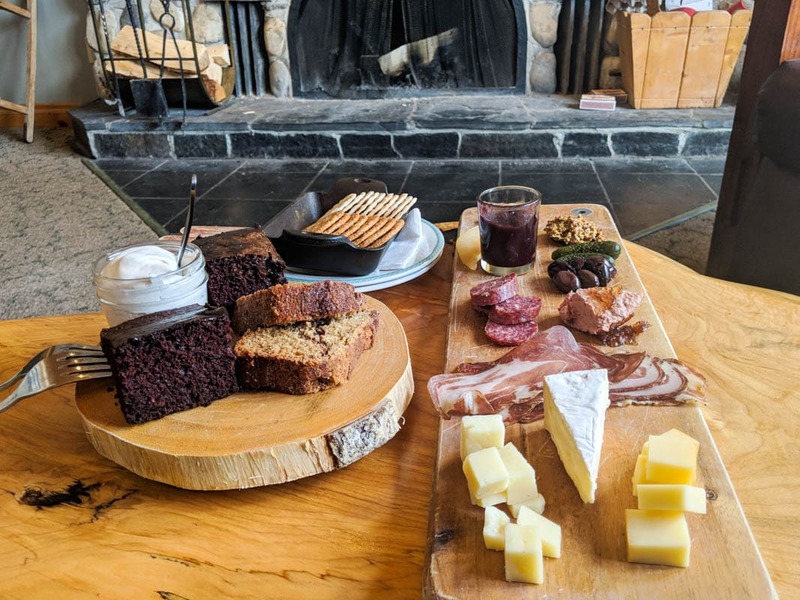 We also loved their afternoon charcuterie boards, and noticed that even if you weren’t staying there, you could stop by on your hike and enjoy a platter by the fireplace. 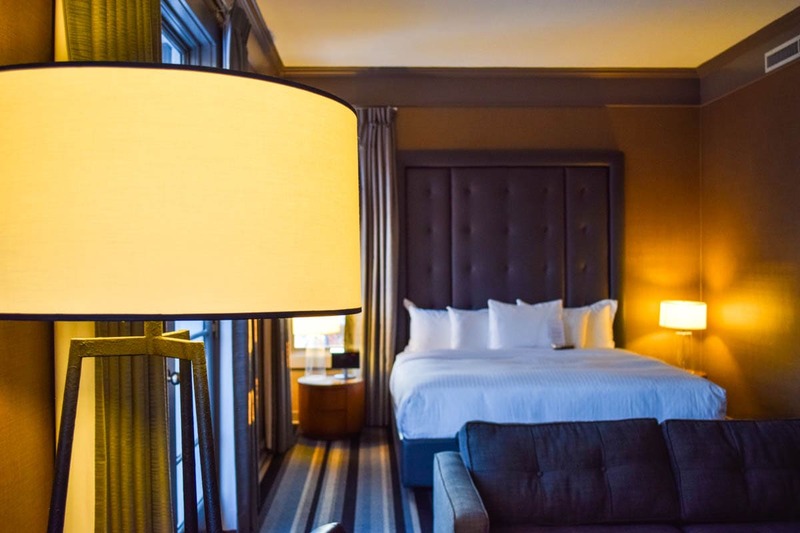 This Banff hotel experience was the perfect contrast to our stay at Mount Engadine Lodge. It’s a large modern hotel built in a courtyard formation, with all standard mod-cons, gas fires in rooms and a restaurant and bar downstairs. 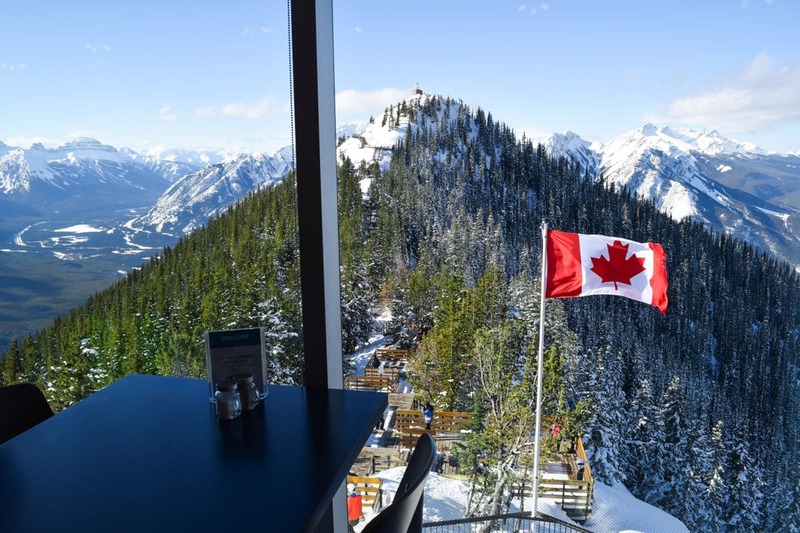 Along with being just moments from Banff’s cafes, shops, bars and restaurants, a big selling point is the rooftop where you’ll find a swimming pool, sauna and two hot pools. It’s a great place to warm up and unwind after a day exploring. The views are lovely too, with mountains all around. There’s also a large (free) underground car park and an Italian restaurant. Saltlik is a top steak restaurant in Banff. We ended up passing by one evening after dinner, and decided to pop in for a cocktail at the bar. The semi-circular bar was busy with people enjoying espresso martinis and whiskeys. We sampled their take on a gin Caesar and a zingy whiskey sour – both expertly mixed, and a bargain at under £10 for two fab cocktails! How many places do you know that serve a coffee and artichoke negroni or a lavender mule? While The Block will make all the classics, there’s an exciting menu of unique concoctions too! Right on Banff Avenue is this stylish shop, restaurant, bar and distillery. The water they use in their spirits comes from Rocky Mountain glaciers, so definitely give it a try. You can tour the distillery, or just take a seat at the bar and try some of their award winning creations including glacier rye, alpine dry gin, espresso vodka and chilli vodka. Don’t worry, if you don’t like your spirits straight, they have a menu of cocktails too. The views from the Banff Gondola are some of the best I saw on my entire trip. 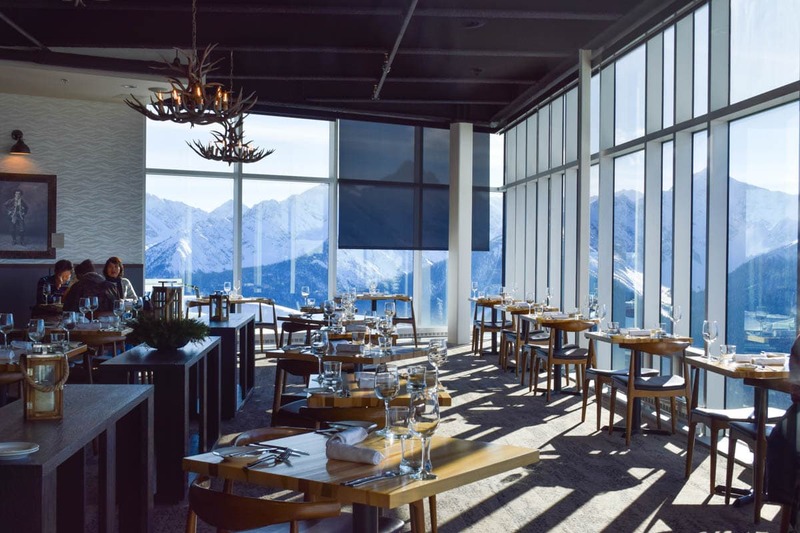 While we didn’t have time to squeeze it in, I’d loved to have dined at Sky Bistro Restaurant, which is located in the building at the top of Sulphur Mountain. It serves a gourmet Canadian menu including Alberta beef and bison, arctic char, scallops and duck poutine. If you’re on a budget or just fancy a coffee and a light bite, there’s the Northern Lights Café, which also has mesmerising views of the snowy scenery. When we popped in, I spotted people sitting with their laptops and thought that must be one of the best ‘office’ views on the planet! After an adrenaline-fuelled morning snow tubing, we headed indoors for some carbs and treats! The burgers were huge and flavoursome. 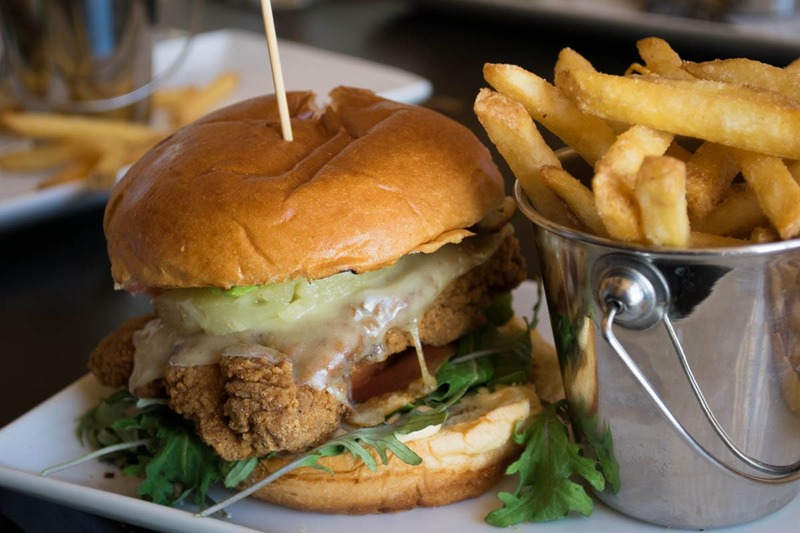 I went for the chicken burger with avocado and fries which was delicious, and although big, I couldn’t stop myself from finishing the whole thing! 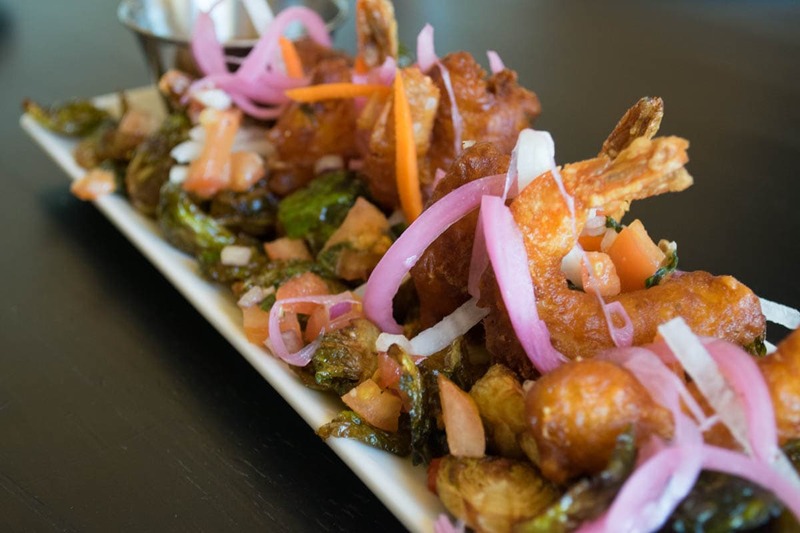 We also shared a speciality of battered prawns and brussels sprouts with pickled red onion and a tangy ketchup. All in all, it was just what we needed after burning so many calories in the cold. If you fancy a healthy alternative between ski sessions, Kuma Yama serves up excellent sushi and ramen with views of the slopes. 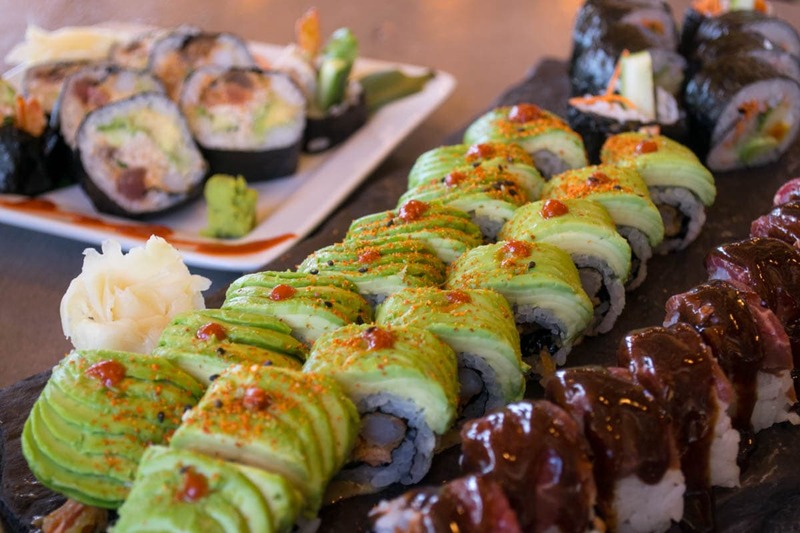 We enjoyed a selection of sushi, and my favourites were the LSB which contained lobster salad, seared alberta beef and beef au jus, and the Dragon which contained shrimp tempura topped with avocado and unagi. 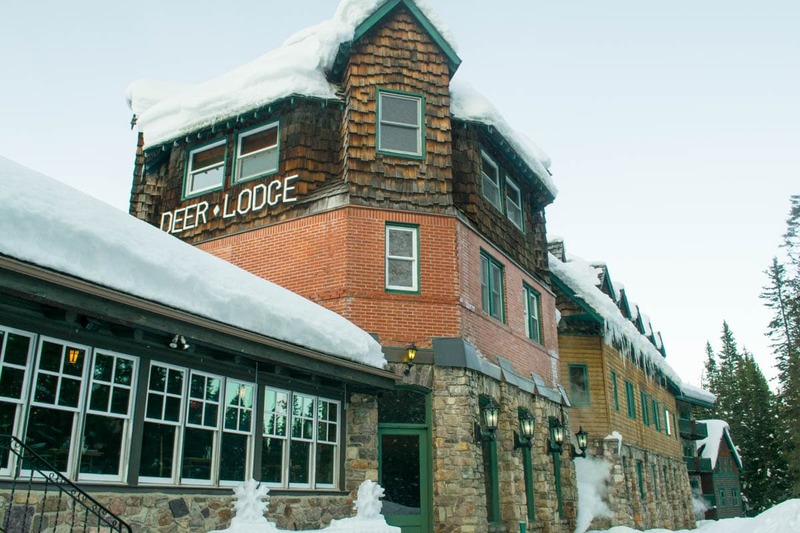 Moments from the famous Fairmont Chateau Lake Louise is Deer Lodge. While the former has a fab reputation, it’s still a chain and we wanted to experience more of the ‘real’ Alberta. 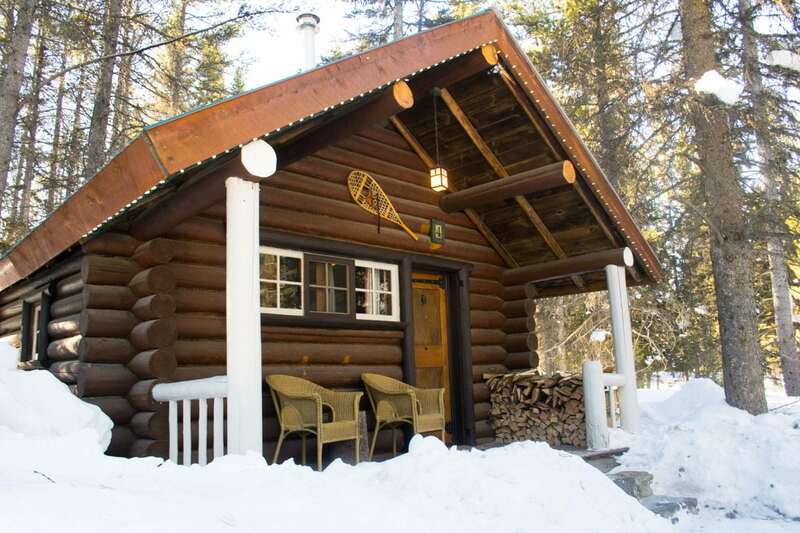 Many of Alberta’s lodges have excellent reviews, plus they’re steeped in history. 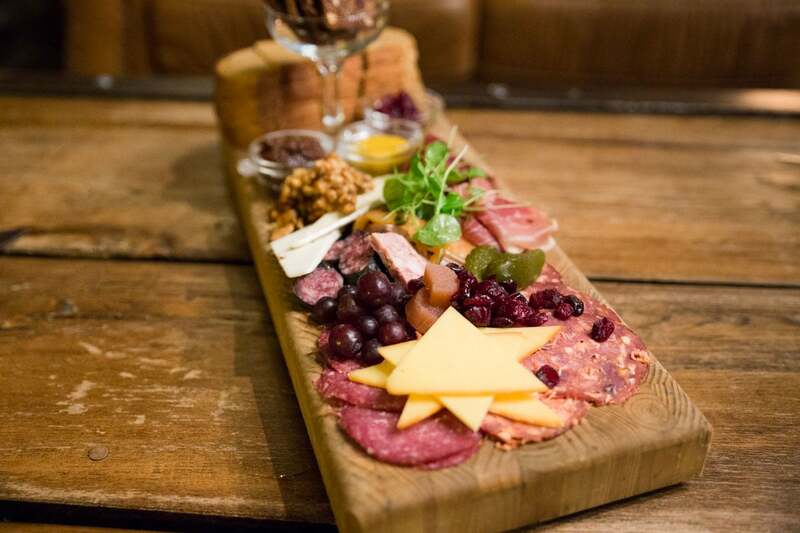 Deer Lodge’s restaurant serves up gourmet dishes, using regional produce. We enjoyed a starter of seared tuna, followed by elk steaks and top Alberta beef sirloin, all while gazing out at the snowy landscapes. One of my favourite touches was the detailed wine list, featuring plenty of Canadian wines. Some of the descriptions were less about flavour and more about feelings… e.g. Perfectly delightful pears dance and swirl around your head… this is wonderfully pleasant! You could tell wine director Brad had sampled everything in the collection and really enjoyed putting the menu together. This was where we finished our winter trip around the Canadian Rockies, and it was a super special place to end one of my most memorable adventures yet. 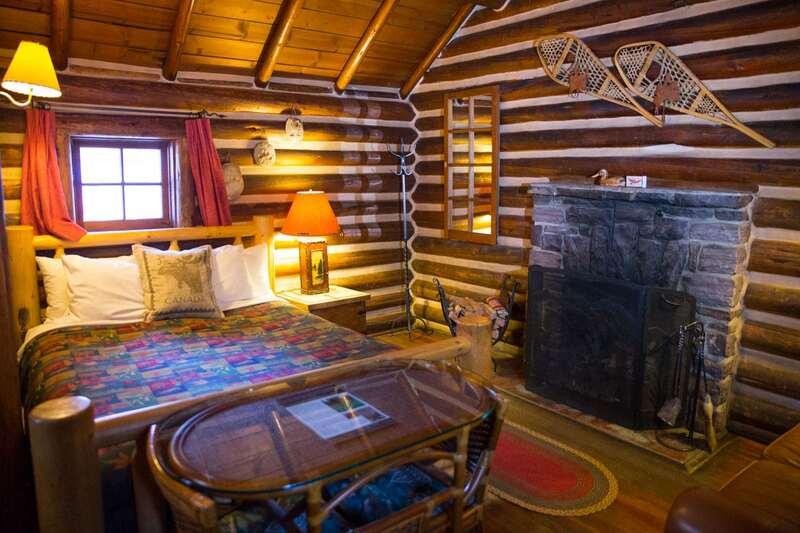 While the lodge is just off a highway, it feels wonderfully remote once you reach the log cabins, which themselves back onto a forest. The log cabins were absolutely adorable, covered in a thick blanket of snow! They feel traditional, and even come with a proper log fire. One of the most magical moments of the trip? Falling asleep to the crackling sounds and orange glow of the fire, with snow and temperatures of -20 outside. While it’s hard to choose, I think the dinner we had at Storm Mountain Lodge was our favourite meal too. It has an exceptional foodie reputation, and the small restaurant was completely full. 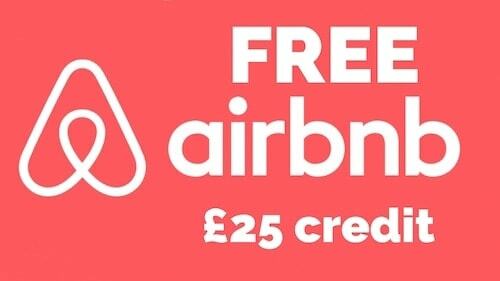 Be sure to book in advance, as this isn’t the kind of place you can rock up and ask for a table. We began our evening in the bar area and enjoyed cocktails and an enormous charcuterie platter with local game pate, elk, spicy salami and plenty more! 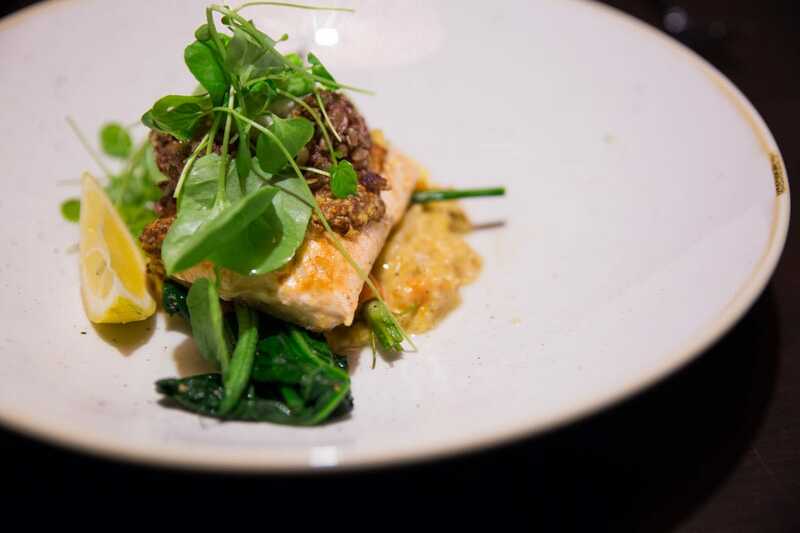 Then for mains we moved to the restaurant area and tucked into arctic char with a flavoursome risotto and swiss chard. 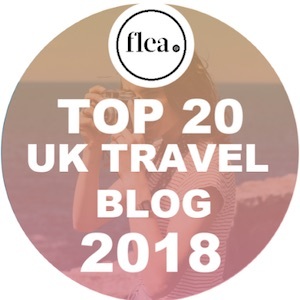 Want to find out the top things to do in the region? 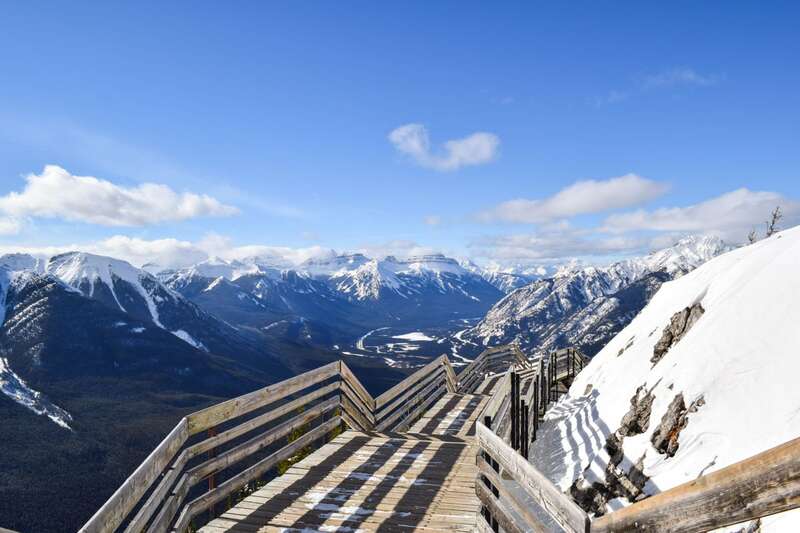 Read The Top Things To Do For Non-Skiers In Banff, Canada. 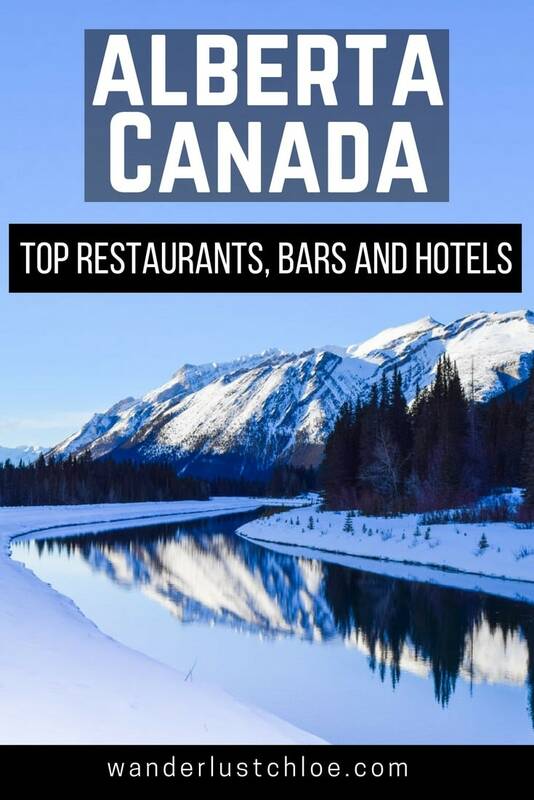 Super keen to visit Canada so have added a couple of these spots to the list. The views from the Banff Gondola are AMAZING! They were so amazing! My fave from the trip I think! This is utterly well and truly beautiful!